There was a time when Bollington had its own police station with its own policemen – and its own prison! This was known as the Bridewell. And it is still there although put to better use today; it’s the local electricity sub-station. You will find it in Round Gardens, behind the Dog & Partridge pub. 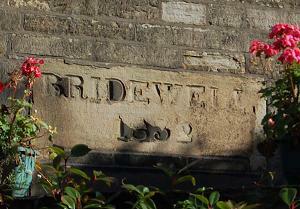 The sign has badly eroded over the years but if you look carefully you may still see the stone block engraved with the word BRIDEWELL , it is just possible to read the name, although the date is harder to decipher. It is actually 1832. The police station was opposite, the stone house on the corner of Round Gardens and Adlington Road. The word ‘bridewell’ is synonymous with a place of detention. I always think of it as Scottish but that may be just because the word was used in Scotland long after it fell into disuse in England. The big doors are a modern change, used to provide access to the power equipment now kept inside. The main (only?) door in police days would have been immediately under the Bridewell stone which is in fact the door lintel. 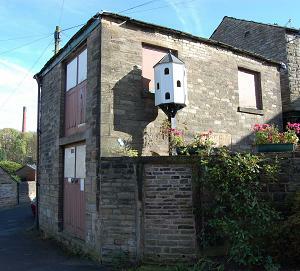 The lighter coloured stone in the wall (in front of the dovecote in the picture) is the closed access to the yard in front of the Bridewell, now part of the pub garden. I don’t know when the Bridewell went out of use, but once closed, prisoners would have been taken to Brunswick Street police station in Macclesfield. Since 2004 that detention facility has also been closed and today arrested persons are taken to the custody suite at Middlewich which serves all of the eastern side of the county.